Shamou explains the importance of musical accompaniment in West African dance. A prescribed movement quality, such as “fluid” can dictate our experience of a movement phrase. Also, familiar shapes may muddy our perception of how the body is actually moving through space. What is the pathway? How much energy is being used? Etc. And of course, sound has a persuasive effect on how we experience and perceive dance. When BDF Young Dancers work with live accompanists, both are aware of each other’s artistic input. It is another chance for our dancers to practice respect and healthy group negotiations. As I’ve witnessed this collaboration, I continue to believe that the combined experience of live music and dance proves to be greater than the sum of the parts alone. Arguably, pre-recorded music engages the senses differently. It’s not wrong, but it is very different! Pre-recorded music can be bossy. It’s dictatorial by nature. It’s unchangeable. However, these characteristics can be beneficial. It all depends upon the goals of the class. Furthermore, dancers don’t always have the privilege of working with live accompanists such as Adam Crawley, Glen Fittin, Peter Jones, Carl Landa, and Shamou on a daily basis. I’ve noticed that dancers can’t resist the conversation that occurs between the body and live music. The experience permits the eyes to take a break (a sense we depend on for most of our information). Instead, it awakens leadership in the ears. Most importantly, dancers build trust in their internal systems, which gives way to new emotional subtexts. Live accompanists receive benefits as well. 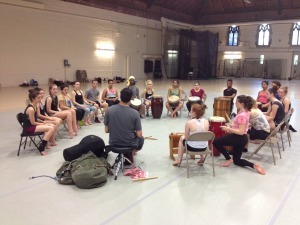 In a dance class, musicians have exposure to new audiences and freedom to explore styles. Here at BDF, the musicians are dedicated to not only accompanying students, but to teaching them. Our accompanists work with dance because they love dance as an art form. They seek a fuller understanding and appreciation of it through their own involvement. It is expected that our Young Dancers will do the same. And boy, are they doing it! This post was written by Ashley Yergens. Ashley is a BDF Social Media Intern for the 2014 summer.